Is toxic masculinity creating a crisis for men? The media seems to be consistently exposing the world of toxic men. Politicians, entertainers, businessmen and actors are appearing amongst the many men abusing their privilege and power. Toxic masculinity is not a new term. In contrast, there are many good men in the world today who find the behaviours of toxic men abhorrent and shocking. Therefore, a counter-balance to the negative characteristics of toxic masculinity is an appreciation of what makes a good man. 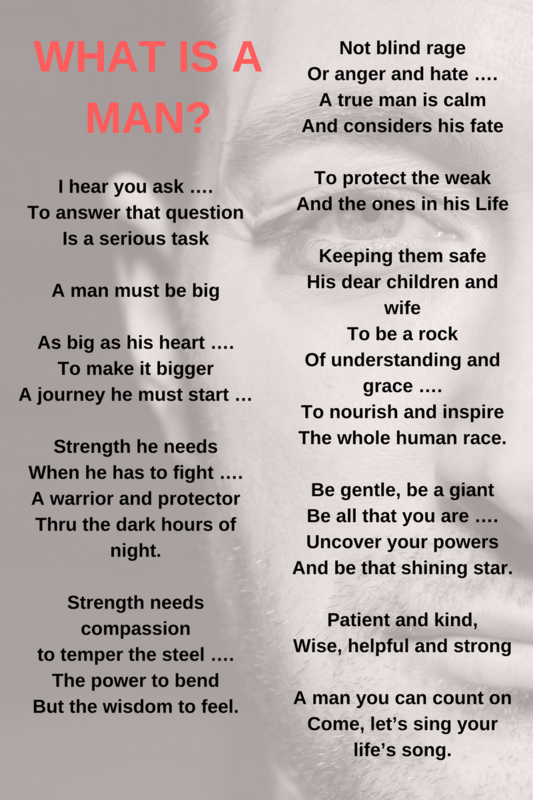 What is the essence of a good man? Countless men are searching for more meaningful and authentic lives. These guys are actively owning and changing their behaviours and attitudes. However, the voices of these men are rarely heard. About the author – Kym Faehsi is a trained art teacher, a practicing artist with 10 one man exhibitions to his credit, and has a lifetime of creative experience. I’m grateful for his permission to publish such a great piece. The poem captures some important messages of change for some men. Could these be the attitudes and behaviours that transform toxic masculinity? What do you think is the essence of a good man?